A full system based on the SpartanMC consists of the processor core, a configurable amount of memory and a set of peripherals which are required for the particular application. 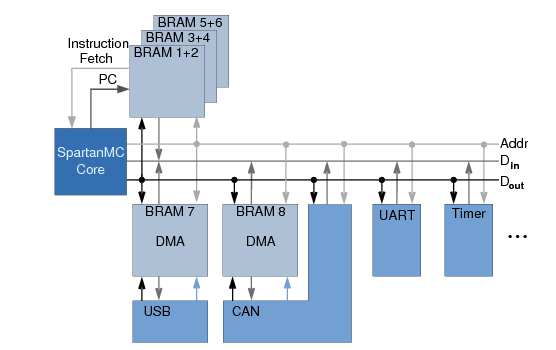 Complex peripherals can work autonomously on the content of a block memory, which allows DMA style operation (e.g. USB). Lightweight devices which just require several registers can be integrated much easier into the system via direct connection to the processors data and address bus (e.g. UART, Timer). Of course, this interface also enables desings using both techniques (e.g. CAN).